A piece of malware known as Trojan.Milicenso that originally surfaced in 2010 has been making a comeback over the past two weeks, primarily affecting office printers in the US, India, Europe and South America, according to Symantec. The resulting infection causes a massive amount of print jobs containing garbage characters to be sent to print servers, resulting in wasted ink and paper, not to mention causing headaches for uninformed office works and IT staff. Symantec says that their initial inspection in 2010 revealed that Trojan.Milicenso was essentially a “malware delivery vehicle for hire” but the latest version is associated with Adware.Eorezo which is an adware that targets French speaking users. The current iteration infects systems using traditional means including malicious email attachments or visiting a website that contains malicious scripts. Unsuspecting users are typically guided to dangerous websites by clicking links in an unsolicited email, Symantec says. Furthermore, they have also found that a large number of samples are being packaged as a fake codec. 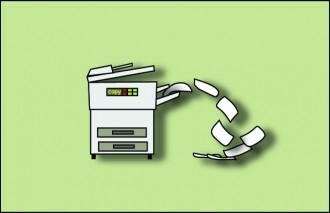 The malicious code continues to send print jobs to the printer until it either runs out of paper or ink. Interestingly enough, the security company notes that this appears to be a side effect of the infection instead of the author’s intended goal of generating bogus ad clicks from serving up advertisements. Symantec suggests that all users follow best security practices and keep anti-virus programs updated with the latest definitions.